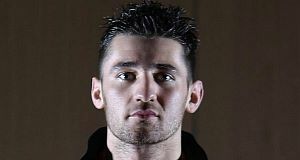 Nathan Cleverly praised the toughness of Tommy Karpency after his emphatic successful WBO light-heavyweight title defence against the American at his homecoming in Cardiff. The 25-year-old was the overwhelming favourite going into the fight against the Pennsylvania southpaw, and was eager to impress in his first fight on home turf in over four years. And he did so in superb fashion, taking control of the bout from the first bell to the last, not losing a round as all three judges scored the fight 120-108 in his favour. "It was good boxing match. It was an excellent fight," said Cleverly. "Tommy showed why he has sparred with world-class fighters. He is very tough, has good power and is a tough fighter." He added: "A lot of people criticised our choice of opponent but I have moved through the British scene with ease, I was in university when I was knocking out the British guys. "So it shows at world level you can't take anything for granted. I knew if I took my eye off the game he would punish me. "He was probably the toughest opponent I have faced over the distance. A lot of guys are tough over six rounds, but wilt in the championship rounds. "But Tommy is a 12-round fighter and it makes a difference." And Cleverly admitted his dominant performance had been the perfect manner in which to mark his return to Wales. The win also marked stage two of a potential treble of sporting success for the principality following the rugby team's Triple Crown-clinching win over England at Twickenham on Saturday, with Cardiff facing Liverpool in the Carling Cup final on Sunday. He said: "I was pleased with the homecoming, that was the important thing, bringing world title boxing back to Wales and it was a special occasion and to win every round is great." Nathan Cleverly produced a classy, assured display on his homecoming night to comfortably retain his WBO light-heavyweight crown with a unanimous decision victory over American Tommy Karpency at Cardiff's Motorpoint Arena. The 25-year-old was the overwhelming favourite going into the fight against the Pennsylvania southpaw, and was eager to impress in his first fight on home turf in over four years. He did so in superb fashion, taking control of the bout from the first bell to the last, not losing a round as all three judges scored the fight 120-108 in the Welshman's favour after Karpency, who battled gamely throughout, found his speed and accuracy too much to handle. Cleverly had spoken in the build-up to the fight of his admiration for another Welsh boxing hero, Joe Calzaghe. Super middleweight king Calzaghe, who retired with an unbeaten record from 46 fights, and Cleverly both hail from the county and borough of Caerphilly and the former fighter would doubtless have been impressed by his countryman as he claimed a win he hopes will lead to a unification fight this summer. Cleverly started with some solid combinations and spent the majority of the first round on the front foot, although a brief slip had Karpency's corner appealing for a knockdown. But Karpency, in his first world title shot, was initially happy to trade shots, although Cleverly remained in control with some judicious body punching during the second. The pattern continued during the third, with Cleverly getting some joy with two solid straight lefts, and by the end of the fourth the challenger appeared to be fading under the strain of Cleverly's incessant work-rate. Into the fifth and a series of sharp combinations again set the American back on his heels as Cleverly stalked him around the ring, and a ferocious right-left shook Karpency in the sixth. Karpency was managing to get away the odd counter, but the end seemed to be drawing near when Cleverly teed off the seventh round with a trio of punishing right hands. But Karpency has become known for his durability and he somehow managed to see out a ninth round which he spent the large majority of penned in his corner by a constant flurry of Cleverly combinations. More of the same followed over the final three rounds although Karpency refused to bow and briefly rocked the Welshman with a left in the final round, but Cleverly's victory was never in doubt to the delight of a passionate home crowd. The win extends Cleverly's unbeaten record to 24 wins, with tonight the 13th of those fights to go the distance.